You can use a generic delegate type as a parameter to a method. We can now create a method that takes a constructed version of this type as a parameter. We could then call the method as shown in the Main method. 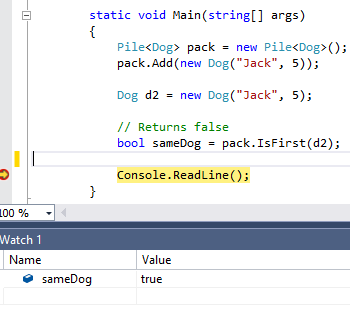 We could also define a generic method that has a generic delegate parameter. This delegate type defines a pattern for methods that take two parameters of a particular type and returns the same type. Below are a couple examples of methods whose signature matches this delegate type. (Methods are only static so that we can call them from another static method). By default, you can’t use equality operators on objects whose type is a type argument within a generic class. If you constrain an argument to be a reference type, you can use equality operators to do reference equality checks. But you can‘t make use of overloaded equality functionality. You can do a true equality check between objects using the EqualityComparer<T> class. Below is an example. EqualityComparer<T> makes use of overloaded equality logic in the Dog class, even though we haven’t constrained the T argument. 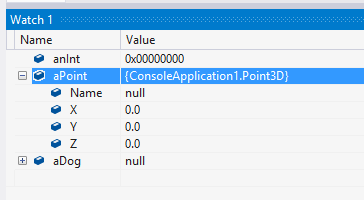 By default, when you specify a type parameter in a generic class, the type can be any .NET type. There are times, however, when you’d like to constrain the type in some ways. You can require that a type passed in as a type argument implement a public parameterless constructor by using the where keyword and specifying new(). The new() constraint tells the code that is constructing the type that it needs to only use types that have a parameterless constructor. Without this constraint, you are not allowed to construct instances of the type passed in as a type parameter. (The compiler will tell you to add the new() constraint). The default operator provides a valid default value for any type. One place where this operator is very handy is in a generic class, operating on the type parameter T. In the example below, we initialize an internal collection of type T so that each element has the proper default value. Using this class, we can see the default values for each type of item.